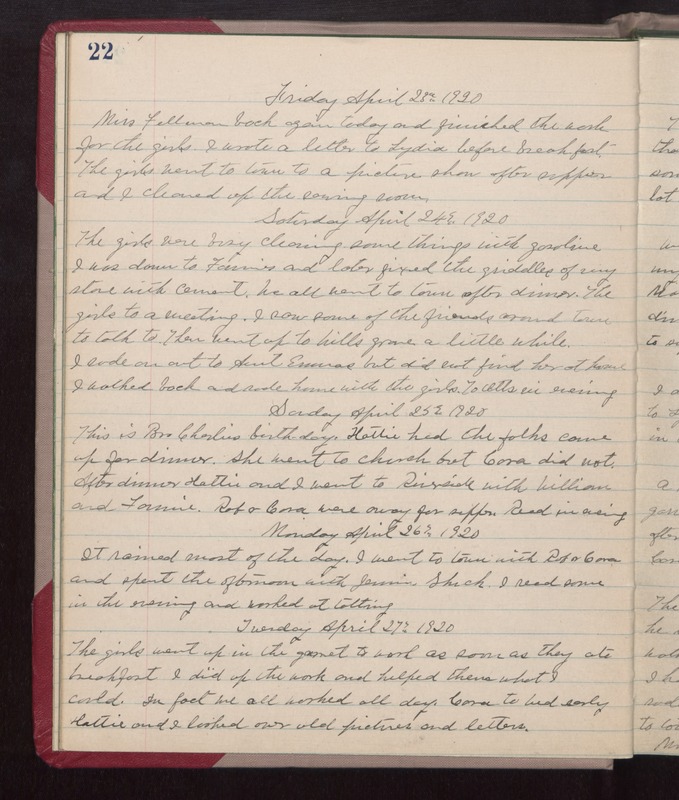 Friday April 23 1920 Miss Fellman back again today and finished the work for the girls. I wrote a letter to Lydia before breakfast. The girls went to town to a picture show after supper and I cleaned up the sewing room. Saturday April 24 1920 The girls were busy cleaning some things with gasoline. I was down to Fannies and later fixed the griddles of my stove with cement. We all went to town after dinner. The girls to a meeting. I saw some of the friends around town to talk to. Then went up to Wills grave a little while. I rode on out to Aunt Emmas but did not find her at home. I walked back and rode home with the girls. To Otts in evening. Sunday April 25th 1920 This is Bro Charlies birthday. Hattie had the folks come up for dinner. She went to church but Cora did not. After dinner Hattie and I went to Riverside with William and Fannie. Rob & Cora were away for supper. Read in evening. Monday April 26th 1920 It rained most of the day. I went to town with Rob & Cora and spent the afternoon with Jennie Shuck. I read some in the evening and worked at tatting. Tuesday April 27th 1920 The girls went up in the garret to work as soon as they ate breakfast. I did up the work and helped them what I could. In fact we all worked all day. Cora to bed early. Hattie and I looked over old pictures and letters.